How To Build A Home Sauna Designed for ALL skill levels. Sets up on cement, pavers, a deck, PT wood or any indoor space, and can be relocated! 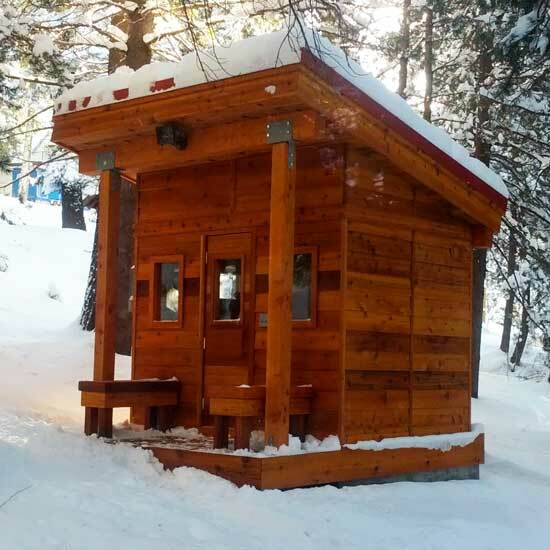 SITUATION: You want a sauna outdoors, or one that sets-up quickly indoors, or you want to relocate it later, or you'd rather not endure construction in a spare room, or perhaps your sauna location is in the woods. The wall panels are screwed together which form the sauna room. Each panel is 6'8"H x 4"D x Width is flexible and depends on your site's needs, but usually 2' or more. Prebuilt ceilng panels completely enclose the sauna. If outdoors, add the sauna roof. Next, you'll need to wire for your sauna heater. A conduit planned through the panel makes it easy to push your wire through. Or your electrician can just drill a hole. Mount or set your heater. Add your benches and you're ready to take a sauna. 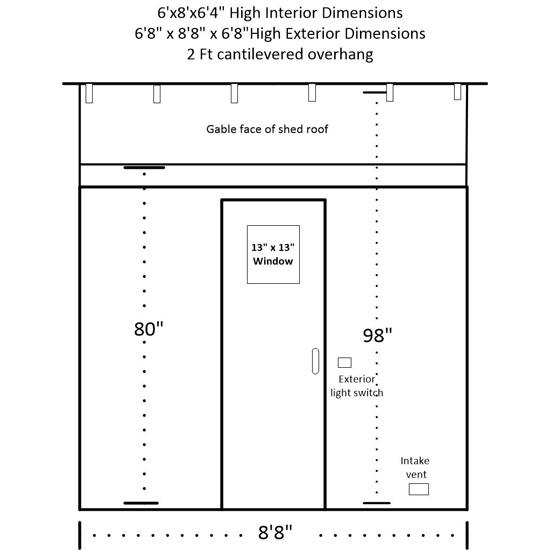 Larger sauna packages (>7ft) may be declared too large for the lift gate by the truck driver and require able people to offload the materials from the back of the truck upon delivery. Please carefully read these terms of shipping and agree during check out. In many cases, oversized items (especially sauna kits) may NOT safely fit on the truck's lift gate. The safety decision regarding offloading is at the discretion of the driver at the scene. Sometimes, unloading the contents off the back of the truck by hand will be required by the customer. Organizing your materials is a necessary step best accomplished ASAP as common carriers only guarantee curb-side delivery. After which, it is your job to move your materials to a better location on your property. There is a 30 minute time window for delivery and the hand-carrying process may take up to an hour. 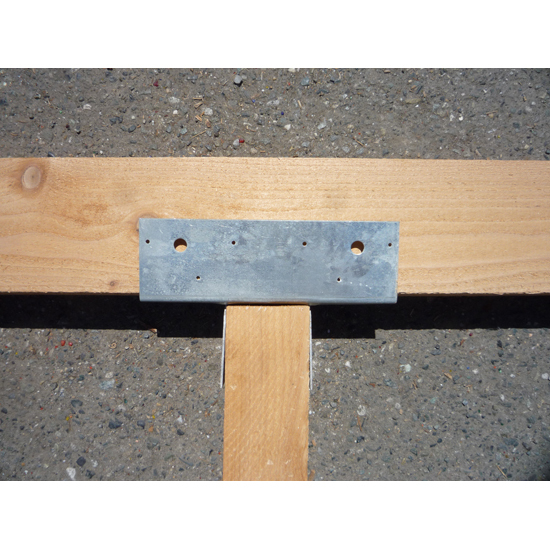 Consider this step a prompter to organize your cedar materials on your project site. Ideally, plan for one or two able-bodied workers to perform any offloading and carrying to your project site. 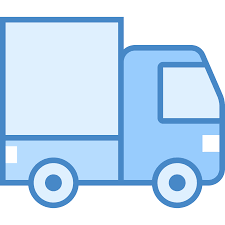 Coordinating the delivery times will be scheduled through the carrier's destination terminal accordingly with the customer's availability. Our modular outdoor sauna kit means assembly is easy. All you need is a screw gun to fasten the panels to the bottom and top rails, slide and secure the ceiling panels atop the walls and you have a sturdy home sauna room! Extra options: Height, heater, flooring, wall windows, etc. 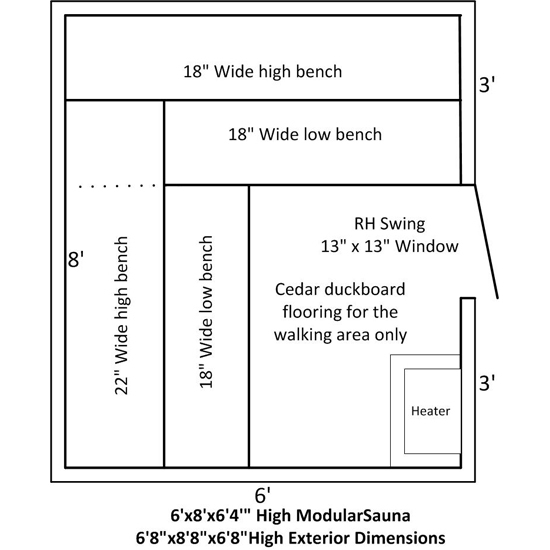 Outdoor sauna kit is 100% Western Red Cedar—even the frame! No pressboard or plywood is ever used. These pre-built, insulated panels form the walls and ceiling of your sauna room. We can make the panels any width you'd like — no extra charge. Design and layout consultation are all included in the price. After placing an order, our staff will discuss your layout and other needs. 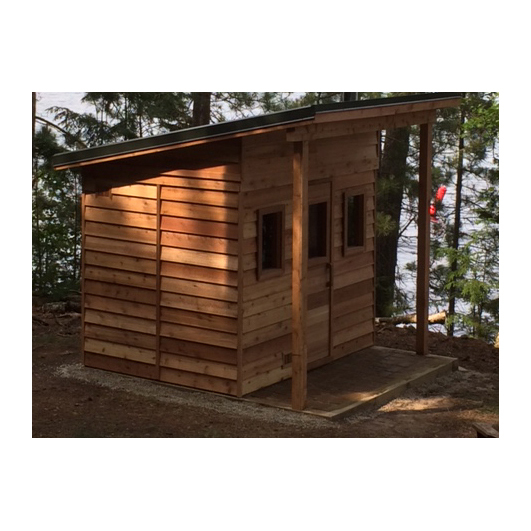 Our standard rooms have clear cedar tongue and groove (T&G) interiors and knotty bevel siding exteriors. 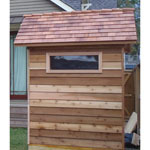 All Cedarbrook outdoor sauna kits are made of 100% Western Red Cedar — even the frame! No pressboard or plywood is ever used. 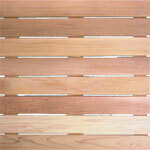 These pre-built, insulated panels form the walls and ceiling of your sauna room. 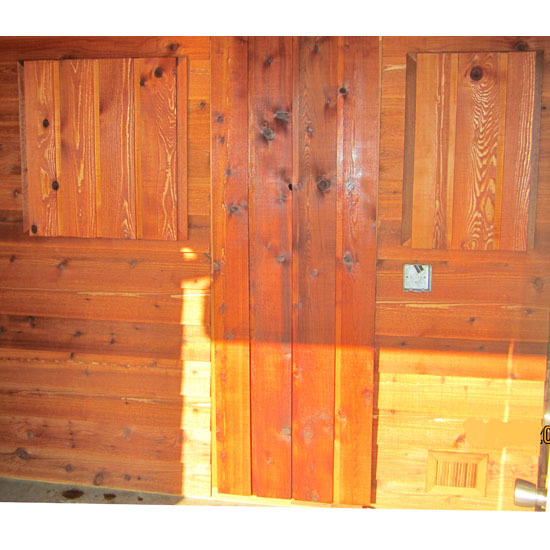 Our standard rooms have clear cedar tongue and groove interiors and knotty bevel siding exteriors. Our outdoor home saunas have more room! — The interior is the full 6' x 8', allowing you to stretch out. 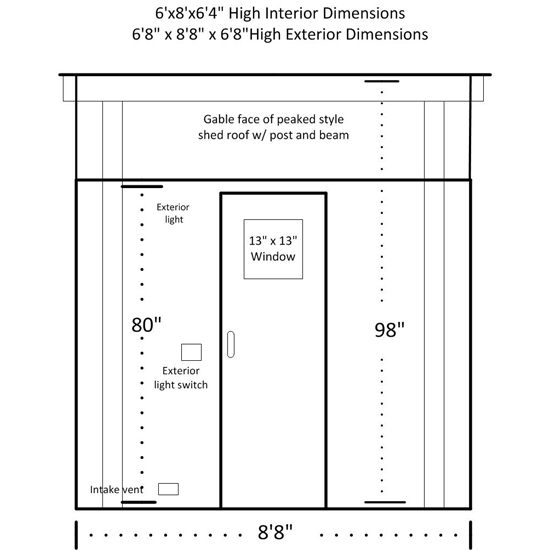 Exterior measures 6'8" x 8'8" x 6'8"H. Our competitors' interior measurements are 4 to 8 inches less. 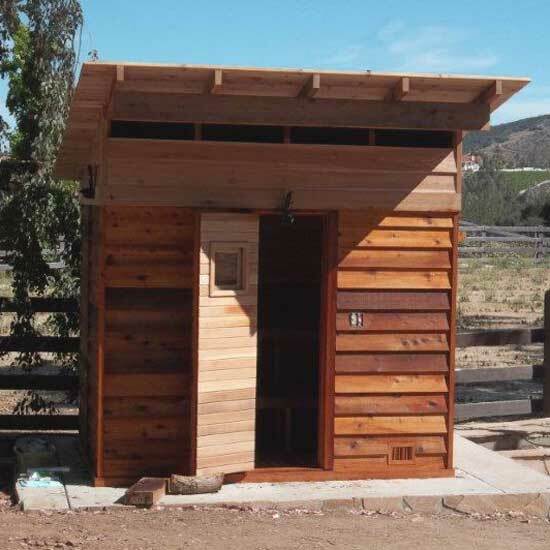 Package Pricing allow you by only the sauna with no heater or accessories, and a few other combinations. You can enhance your sauna by substituting another sauna heater, height of your sauna room, flooring and wall windows. 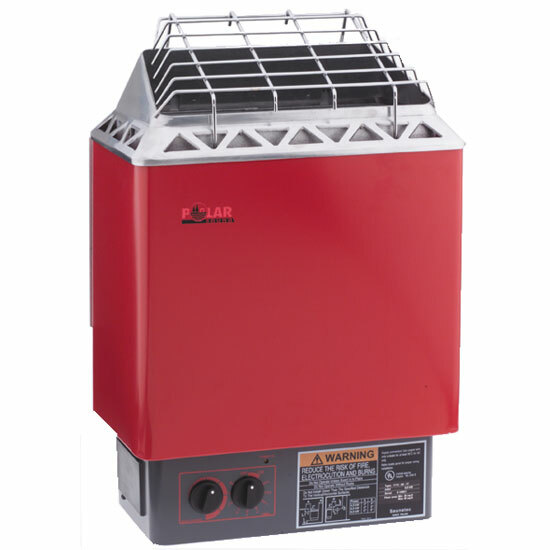 Polar HMR80 heater — 8000 watt (240 volt) heater with built-in controls & rocks. Tylo sauna heaters may be substituted — see heater option box above. You may also substitute a wood-burning or gas heater. 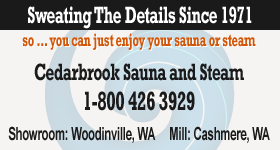 Give us a call for a recommendation for your home sauna size. 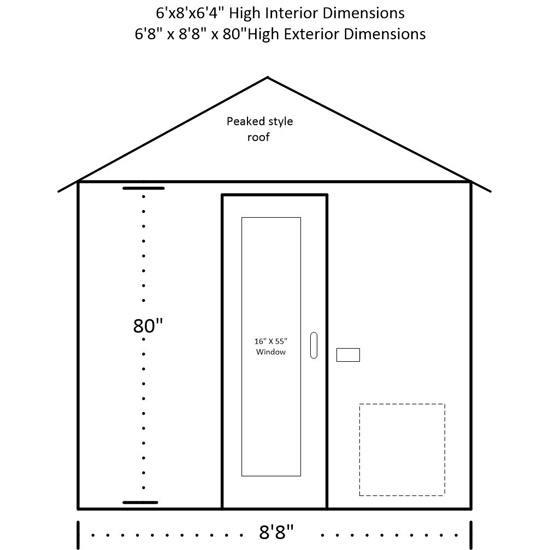 Residential Sauna Door with 13" x 13" window, also see 10" x 18" window, 16" x 55" window and no window options. You can remove the heater and accessories to reduce the price, as you need (see options). Tongue and groove (T&G) interior and bevel siding outside to form the walls and ceiling. T&G exterior optional. Pre-built benches with commercial style 2"x2" tops, bottom-fastened (prebuilt bench supports included). Number of benches is set in the options. 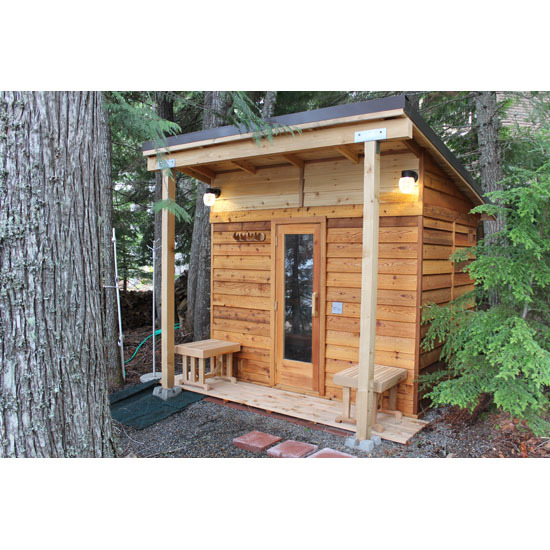 Insulated pre-hung cedar sauna door with 13"x13" window and swings either left or right. We offer double insulated window options in several glass sizes. 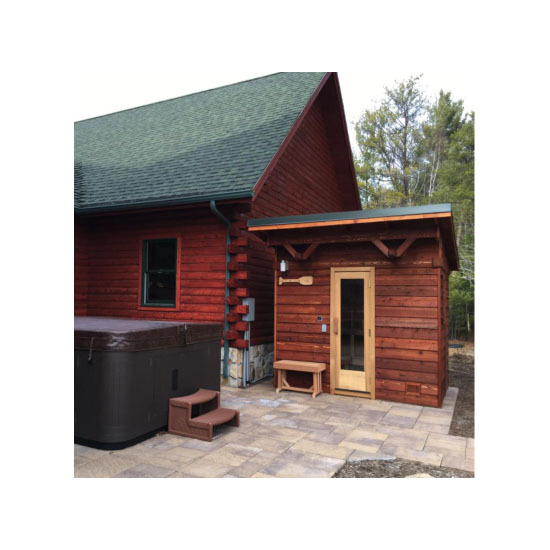 Ventilation system built-in — A sliding, adjustable inlet and outlet system ensures that your sauna maintains a uniform temperature, conserves energy, and provides a fresh oxygen supply. Options for your sauna package are below and will affect the price. If you want to see a picture, click the links below. Electrical, gas or wood-burning sauna heater substitutions are always an option regardless if they are offered above. Give us a call so we can best recommend the unit for this size sauna. Enlarge or remove the door window (see options above) – Let more light in or have more privacy, a personal choice. Electrical Conduit in walls for light, light switch or heater – Makes wiring a snap later. 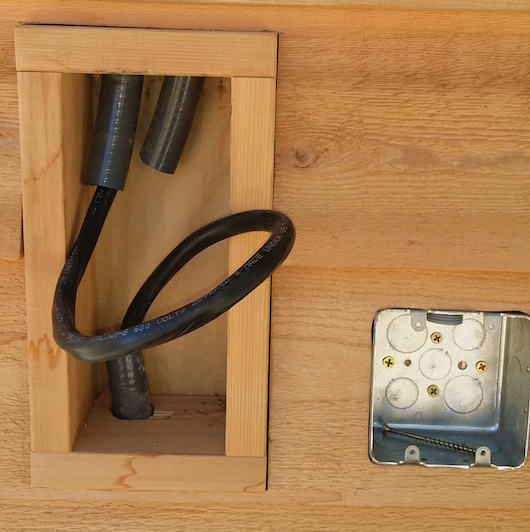 A built-in electrical conduit lowers your electrician cost to wire your sauna. The conduit runs through the ceiling panels and protrudes out the top of the sauna. The electrician will couple onto our built-in conduit. This also provides a disconnect point if you decide to relocate the sauna. Increase interior height to 6'8" or higher! Visit these links below to see a picture as well as to add the item to your order. Add sauna windows to the sauna wall panels. 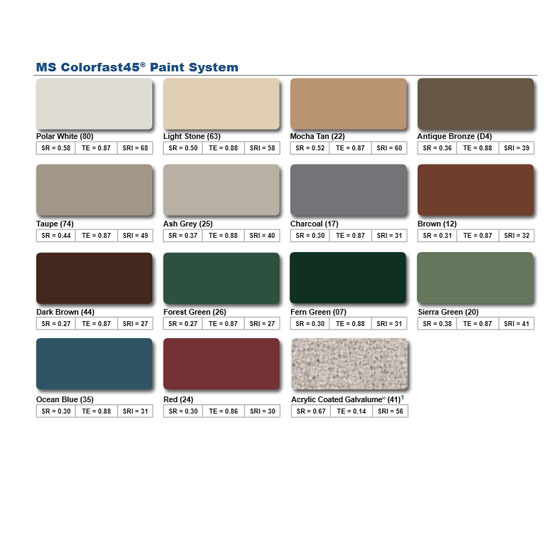 See an example of T&G exterior modular siding. 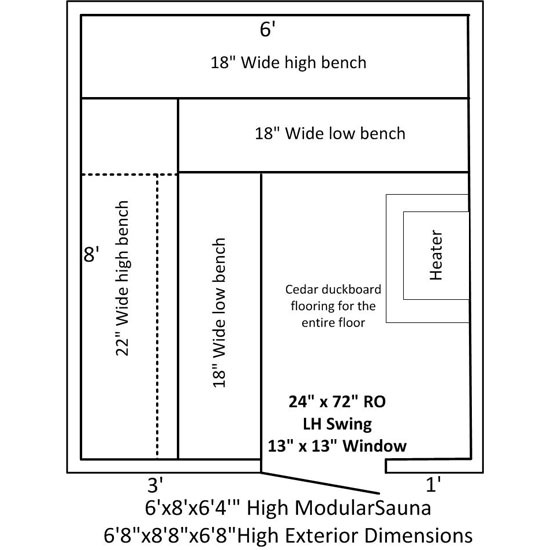 If you would like to customize your home sauna layout, or if you would like to make substitutions or deletions, please call us anytime. We can nearly always include your changes in our package price. 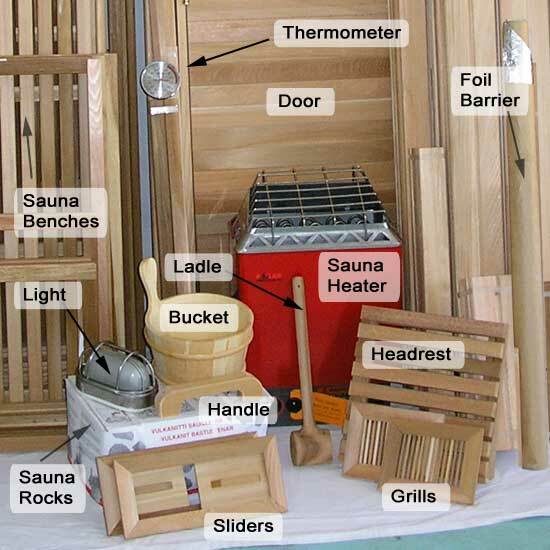 DIY Sauna Kits Compared | Do It Yourself Sauna Kit Guide — DIY sauna kits' features, costs and benefits are reviewed and compared for the home sauna do-it-yourselfer with quick guides on how to build the sauna kit, plus things we like, and other sauna facts. How to Build A In/Outdoor Sauna with the DIY Prefab Kit — A good article + videos demonstrating our easily the outdoor sauna is erected outdoors or indoors. 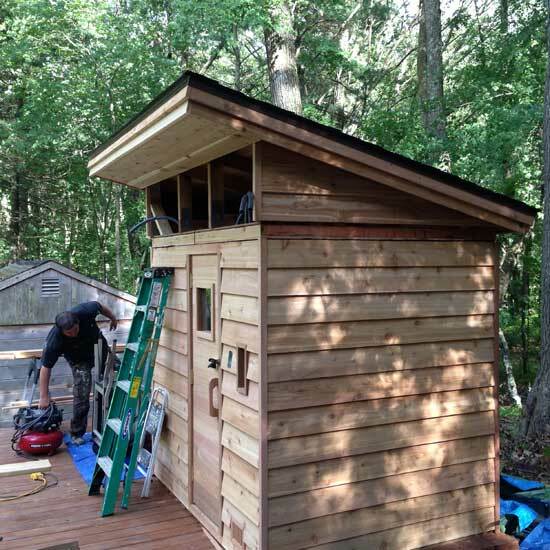 How to Build A Sauna | Convert a Room — A good article discussing the steps, tools and supplies needed to build a sauna and convert an existing room to a sauna room. Home Sauna Room Advantages — Reviews the advantages of having a sauna in your home, such as cost, comfort, privacy, ambiance and convenience. How do I prepare the base for my outdoor modular sauna kit? —Quick tip on which bases work best for outdoor modular saunas. Sauna FAQs —A collection of common questions regarding indoor and outdoor saunas. How to Take a Sauna —How to enhance your home sauna experience with infra-red lights, essential oils in steam, sauna bathing and tapotement with venik. FREE Shipping on all raised garden beds. What are my basic sauna kit choices? 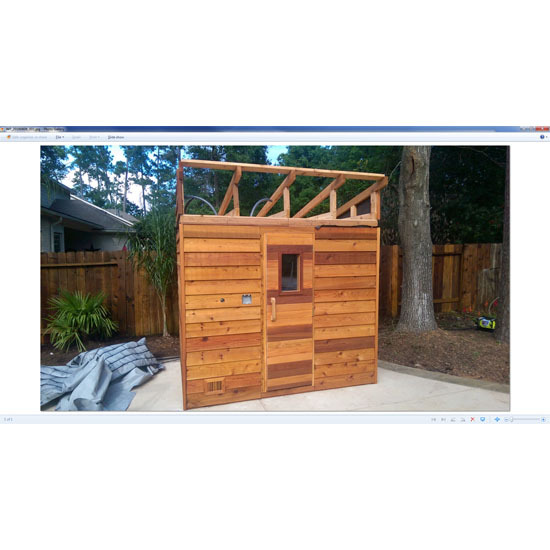 A sauna kit assembled with pre-made insulated cedar panels forming the walls, ceiling, and roof. May be relocated. Custom-cut cedar boards lining the interior of a framed room. Sold separately or with door, heater + accessories. 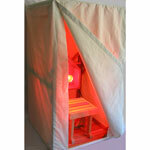 A cedar one-person frame wrapped with canvas contains the light and heat emitted from an infrared light box. 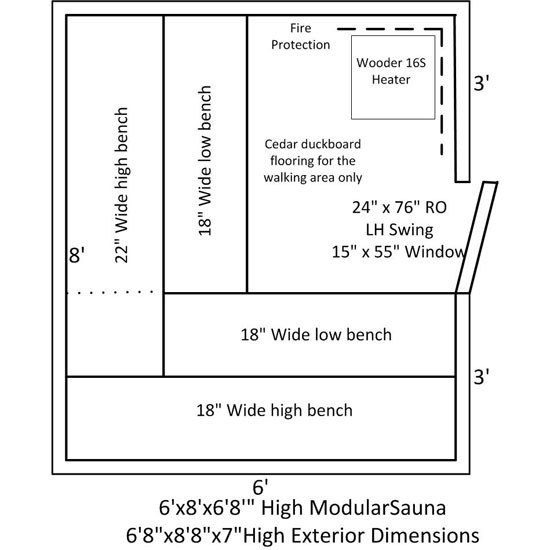 Portable saunas designed for easy assembly using infrared heaters at lower temperatures. NOT SOLD HERE. 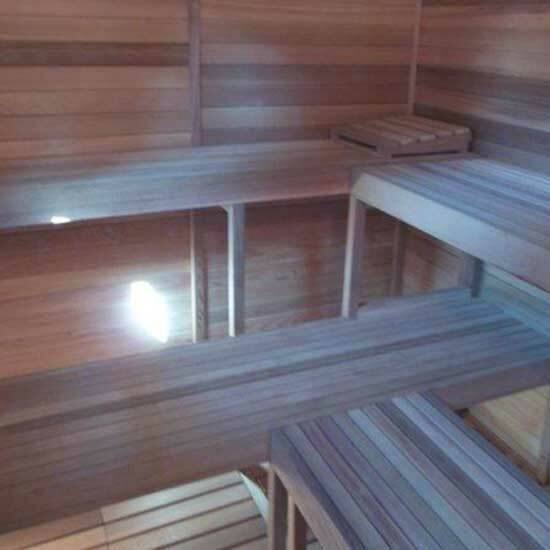 *All our sauna packages include a sauna heater, sauna benches, sauna door, and accessories. Compare ALL sauna kits. *All sauna rooms may be heated using a variety of sauna heaters: electrical, gas & traditional wood-burning, and infrared lights & emitters.